Returns to the simplest domestic capitalization-weighted indexes have dominated virtually all active strategies over the nine years since the global financial crisis. It’s not hard to understand why many investors have opted to eschew active strategies altogether, and instead have migrated en masse to the lowest cost index products. And, for most investors, when considering traditional active long-only equity or bond mutual funds, it is prudent to place a high priority on fees. After all, most equity mutual-funds and smart-beta index products will have a correlation of 0.8 or higher to a traditional 60/40 portfolio1. As a result, they are likely to produce only small marginal benefit in terms of portfolio efficiency. However, the equation changes when investors consider allocations to alternatives, such as market-neutral and managed futures strategies. Alternatives are constructed to capture returns from sources that are structurally uncorrelated with equities and bonds. Therefore, they may be expected to be uncorrelated to core portfolios, and substantially improve portfolio efficiency by increasing returns, reducing volatility, or both. However, many investors in alternatives evaluate these products using the same criteria that they use to evaluate traditional funds. 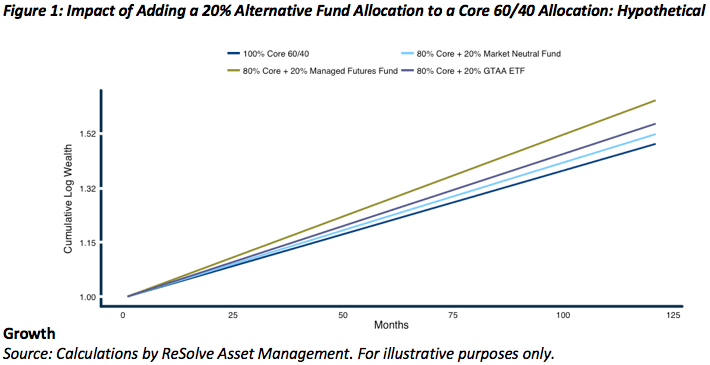 The evaluation of alternatives introduces an extra dimension into the equation that investors don’t need to think about with traditional equity funds. It’s the concept of capital efficiency. Capital efficiency measures the amount of market exposure one can achieve with an investment per unit of capital invested. This has become a central theme for many institutional investors, who understand that they may face low expected returns on capital in their core portfolios over the next few years. Consider two funds, A and B, with similar expected Sharpe ratios, fees and taxes. In other words, the funds are equally efficient. However, fund A is run at 6% volatility while fund B is run at 12%. This is possible in the world of alternatives because they often use leverage or derivatives like futures. Given that fund B runs at 2x the volatility of fund A, fund B should be expected to produce 2x the excess return. In other words, an investor who carves out 20% of their portfolio to invest in liquid alternatives would gain 2x the marginal improvement in returns and Sharpe ratio on their portfolio by investing in fund B instead of fund A. To help illustrate the point, imagine an investor owns a traditional portfolio consisting of 60% in a U.S. equity index ETF and 40% in a bond index ETF. Acknowledging that expected returns are low for both stocks and bonds at the current time, the investor wishes to diversify with a 20% allocation to alternative investments. His objective is to raise his expected returns with minimal risk. A global tactical asset-allocation (GTAA) ETF of ETFs with an expected gross Sharpe ratio of 0.8, expected long-term average annualized volatility of 8.25% on a maximum of 100% gross exposure, with a gross expense ratio of 0.8%, and a correlation of 0.5 with the current portfolio. Let’s dig a little deeper into how I arrived at these assumptions.